Bodnant Garden seemed huge when I was dragged around as a child but it’s a lot bigger now and I no longer need any encouragement to explore. In recent years the gardeners have opened up new areas such as Old Park, Yew Dell and most recently The Far End, an extra 10 ½ acres. As its name suggests it’s about as far as you can get from the reception, a gentle downhill stroll, perfect for mobility scooters, buggies and wheelchairs. The Far End is based around a series of ponds that ensured a steady supply of water to the mill. One of them is the Skating Pond, which is where the owners used to skate in the winter and go boating in the summer. Another is the Otter Pond, so named after an exhausted otter took refuge here and Lord Aberconwy ordered the Denbigh Hunt off his property. 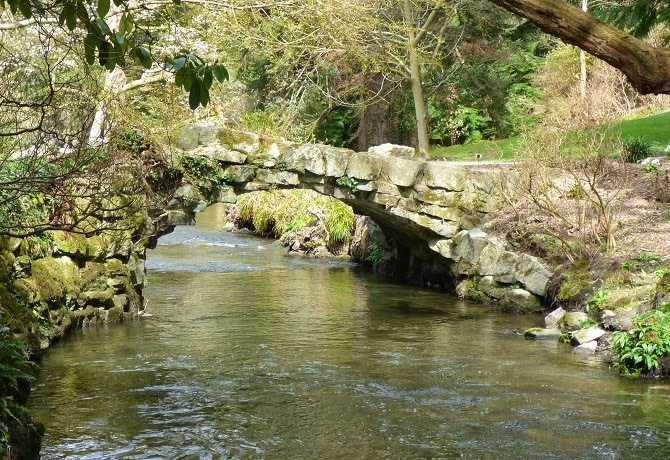 The ponds are connected by streams crossable by a perfect Billy Goats Gruff bridge and, for the more adventurous, a set of stepping stones complete with hand rail. 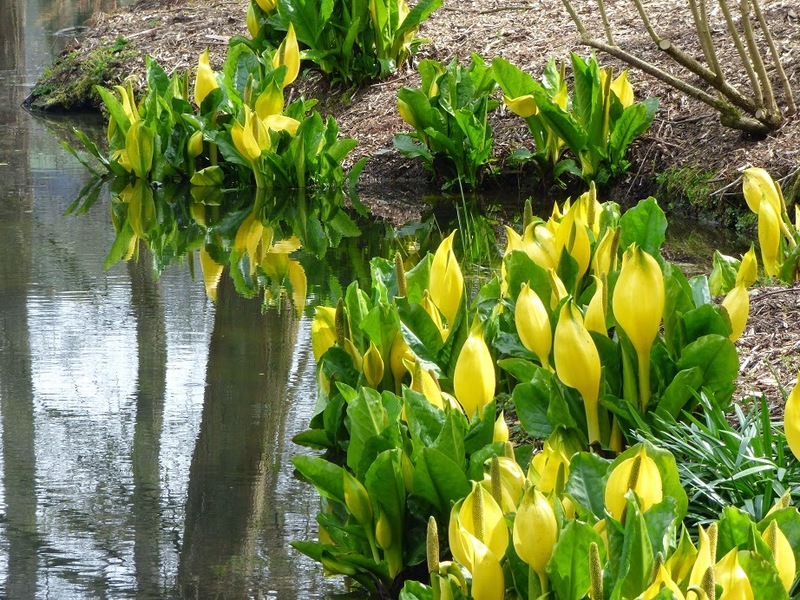 In early April the camelias were still blooming (delayed by a winter cold snap), magnolias were stunning, daffodils had just passed their peak and skunk cabbages were looking brilliant. If you want to know why they get their name, just rub the flesh of the plant and take a whiff. 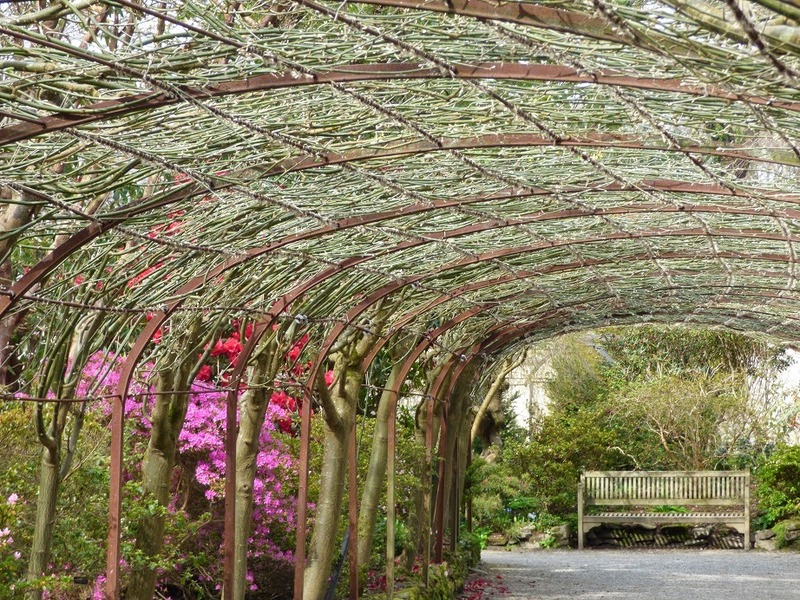 For many people the most iconic sight is the Laburnum Arch, with countless coachloads coming to see its blooms in late May to early June. But it was good to see it naked, after two gardeners had spent most of January and February pruning and tying it into place. It looked more like basket weaving than gardening. 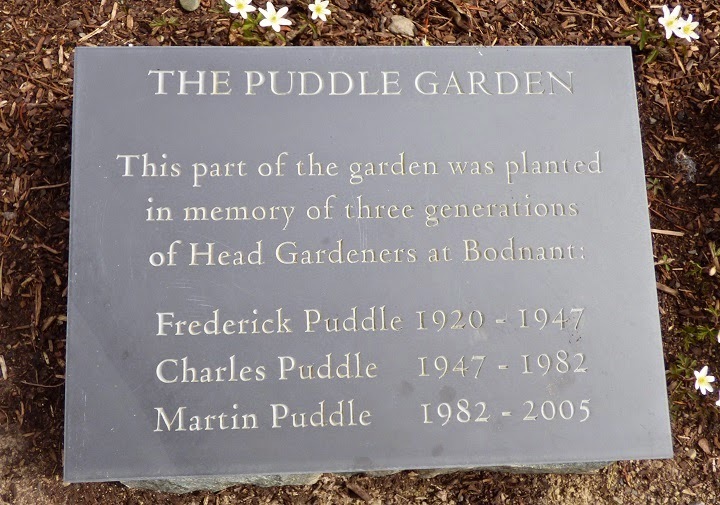 A new head gardener has been appointed, John Rippin, who follows in the footsteps of Troy Smith and before him the three generations of the Puddles.